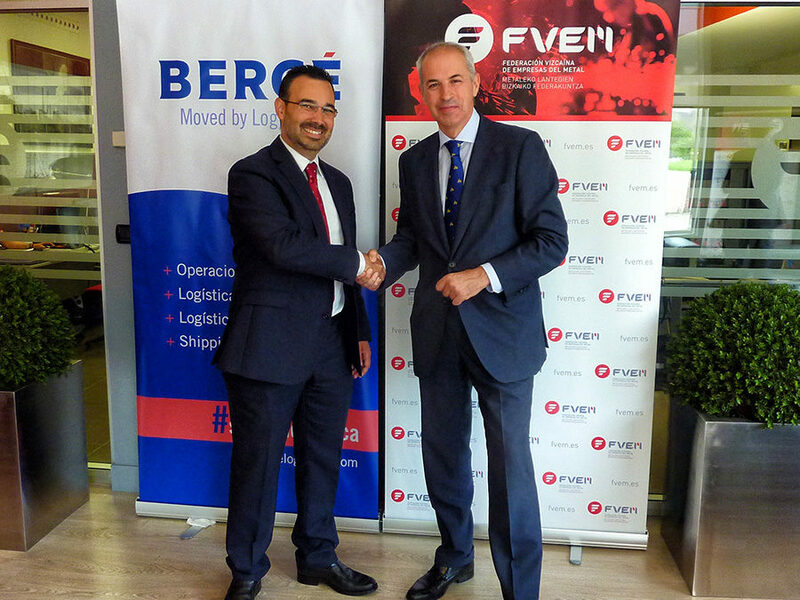 BERGÉ joins the Biscay Federation of Metal Companies (FVEM) as a collaborative partner. The agreement was signed by Gorka Zabala – Managing Director BERGÉ Bilbao, and Adolfo Rey – Managing Director of FVEM, who highlighted “the importance of establishing efficient logistics, which is a crucial factor in the industry’s value chain. Moving forward, we will have the knowledge of one of the main operators both nationally and internationally, which will enhance the competitiveness of our companies”. The aim of the agreement is to foster knowledge in logistics between metal companies in Biscay by developing awareness-raising activities. This incorporation will help promote various actions on the importance of logistics solutions in the metal sector, as well as the international marine transport for import and export processes of Basque companies. Specialising in various logistics divisions (port operations, integrated logistics of vehicles, value-added logistics and externalisation of process, and shipping), BERGÉ is a leading company in the Basque Country. Its activities at the ports of Pasajes and Bilbao are characterised by regular line services, consignment, stevedoring, as well as internal factory management, storage and multi-modal transport it provides to major companies in the steel industry, as well as others. BERGÉ operates in 27 ports around Spain and Bayonne (France), with an annual activity of more than 26 million operated tonnes, 10,000 vessels consigned, around 900 chartering operations and over 1,000 ports of call each year. Through its value-added services, Bergé helps produce around 500,000 vehicles in Spain and manages 1.7 million tonnes of steel products. Meanwhile, FVEM represents the metal sector, the most important in Biscay, where over two million companies that drive the territory’s economy forward are located. In Biscay alone, this sector generates more than 3 billion euros of added value, covers 1.8 billion in salaries and close to 500 million in social contributions with investments of more than 300 million euros each year. The metal sector and all of its sub-sectors directly employ over 50,000 workers in Biscay. Formed in 1977, FVEM integrates close to 900 companies, which employ over 35,000 people, making it the largest sectoral business organisation in the Autonomous Region of the Basque Country.